Time to tour The Bartons Arms. Pubs with ping pong, pubs with bowling, pubs with cats, pubs with passwords. Dive pubs, bingo pubs, golf pubs, pubs that you're not allowed in unless your name's Rupert. The themed pub concept has reached a shark-jumping frenzy of late. What the hell happened to the pub pub? Well, it's been doing what it's always been doing: sitting almost untouched, in the Newtown area of Aston, since 1901. 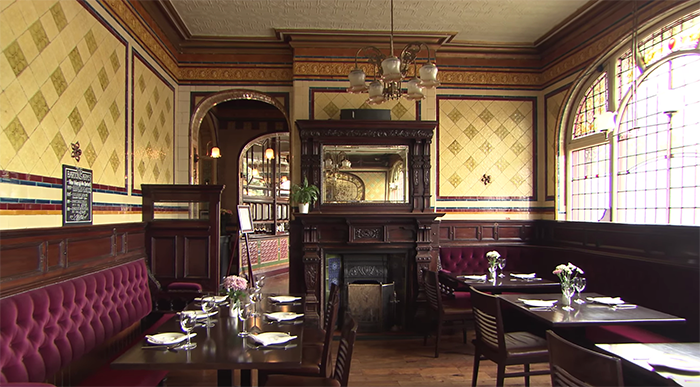 The Victorian-era Bartons Arms, the city's most beautiful boozer, now runs tours of its historic interior. So we got our Goodnight Sweetheart on and went back in time. Combine the alarming rate at which pubs are closing (18 a week) and Birmingham's uncanny ability to level its most attractive buildings and it's a minor miracle that one of the nation's most ornate watering holes remains. The existing building was built over 100 years ago at a cost of £12,000. It was the flagship of the Mitchells & Butlers brewery estate and, get this, they built it deep in Ansell's brewery heartland just for the sheer chutzpah of it. Back then, Aston was still ten years away from even being part of Birmingham! Though attractive, the brick and stone neo-Jacobean exterior — inspired by the nearby Aston Hall — belies an interior that'll knock you on square your backside. Originally it was built in two distinct halves: the working class area (two images above) and the upper class section (part of which is visible directly above). Neither half could be reached directly from the other. 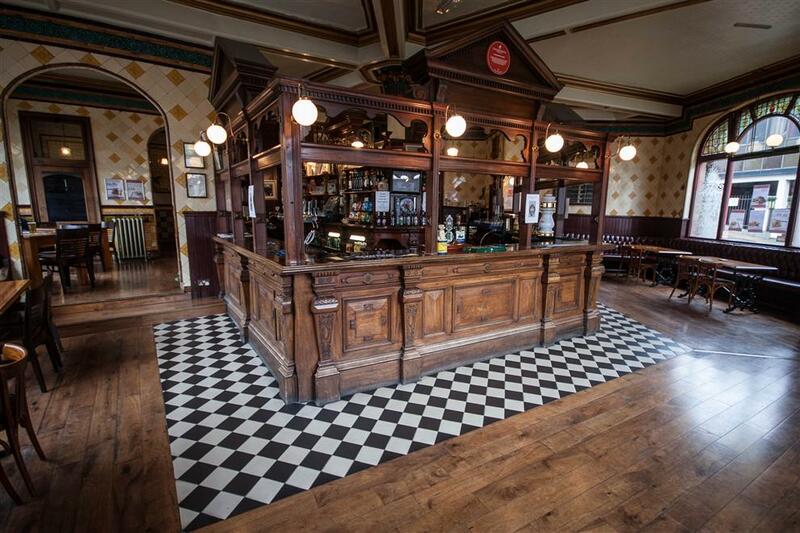 They have, of course, knocked the walls through to make it one fluid boozer, but the immaculate hallmarks of both sections remain. The Bartons has the most snob screens of any pub in the UK. 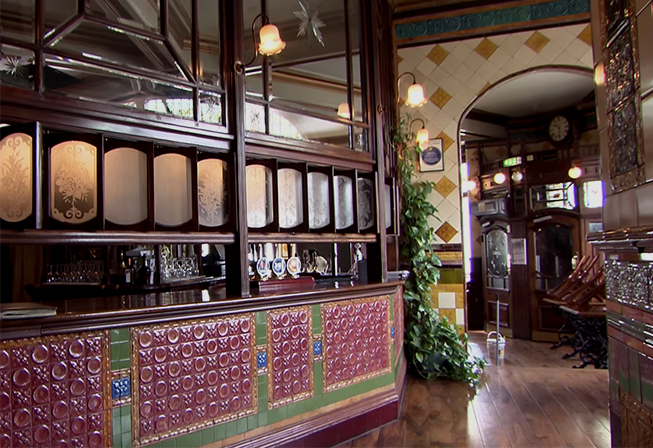 The twistable frosted windows (above) allowed those in the upper class section to either choose not to even look at the working class on the other side of the bar or, worse, could position their windows to spy on their workforce having a boozy lunch. They also allowed for privacy in discussing matters without the bar staff earwigging. The mahogany woodworkings still smell rich (you do look a bit odd sniffing them, mind), and there are stained and engraved windows and mirrors, with a sweeping centrepiece wrought-iron staircase. Wall-to-wall Minton-Hollins tiles, from shiny-glazed decorative patterns to huge painted scenes, complete the look. 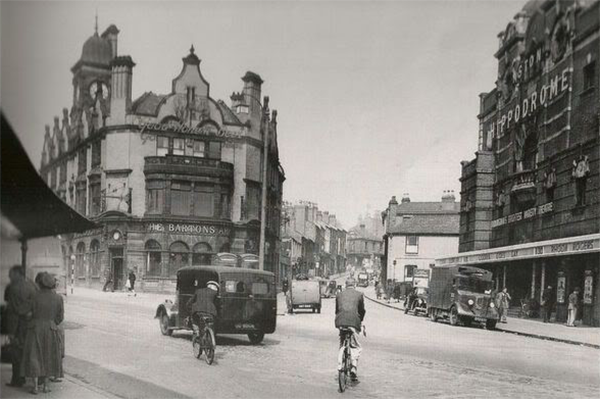 Ever associated with the long-since razed Aston Hippodrome — torn down in 1980 — big acts would perform in the theatre and sleep at The Bartons just opposite. You can see how close they were above. 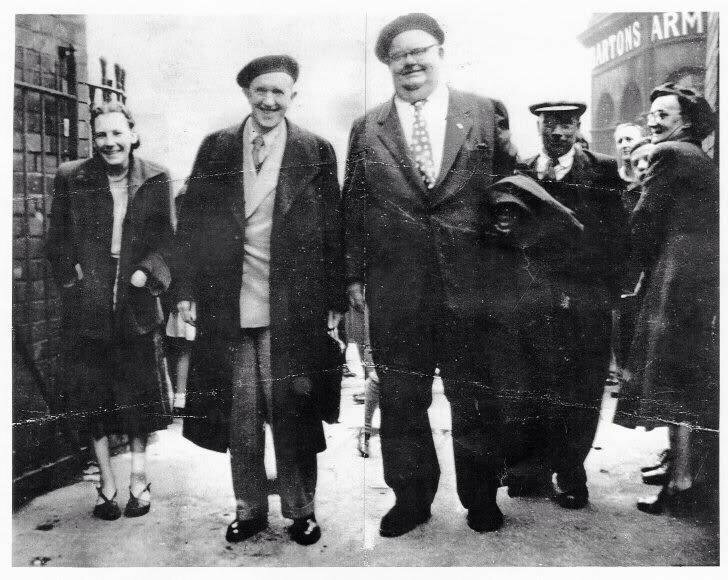 Laurel & Hardy were patrons of the pub, the 1954 photo below being salvaged from a bin, the crease marks still evident from when it was folded and flung. You can make out the pub's signage. More recently Ozzy Osbourne has been in, having been a regular attendee as a youngster. Charlie Chaplin, it is thought, drank and lodged at The Bartons, too. The cavernous cellar runs the length of the building, with the beer barrels dropping through the same cellar drop today as they did on day one. 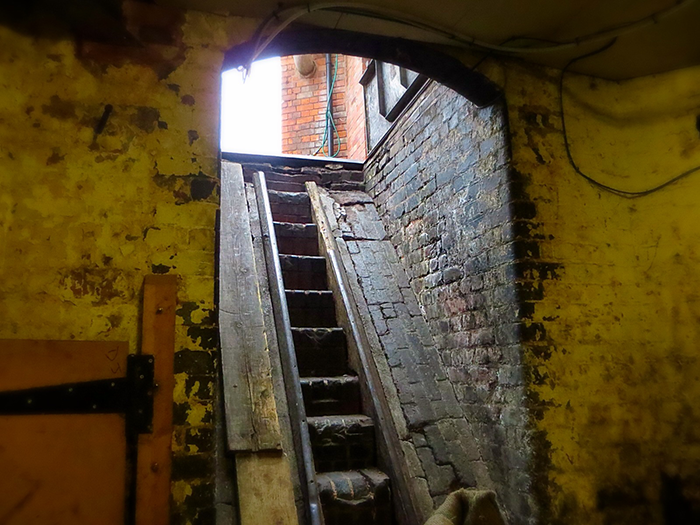 Allegedly there is a tunnel that used to run from the cellar of the original pub that was on the site and the nearby Aston Hall. Throughout, many of the pub's lamps, though working on electricity now, still have twistable taps from their gas days, and the upper class area has bell pushes dotted across the walling from when tables were waited on at the push of a button. Tours run once a month and cost £19.95 per person. The Thai kitchen that's been in place for 18 years will feed you once you've had a nose about. Or you could just pop in at any point for a quiet pint. You can still do that in some pubs.